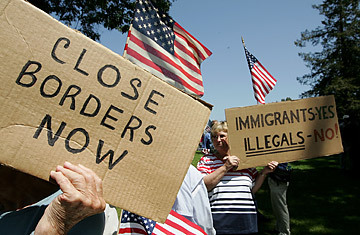 Anti-immigration demonstrators hold signs and American flags during an anti-immigration rally. When the U.S. sneezes, Mexico catches a cold  so goes the old saying that is ironically being turned on its head as all eyes look south, afraid that the U.S. may be infected by what appears to be Mexican swine flu. But while public health and government officials on both sides of the border battle the outbreak, a virus of another sort is spreading across the Internet as anti-immigration groups use the imminent flu pandemic as an argument for closing the U.S.-Mexico border. But shutting down the almost 2,000-mile-long U.S.-Mexico border would be a disaster of a different sort. While anti-immigration groups focus on the impact of illegal entrants to the country, there is little attention paid to the goods that flow both ways: wheat (vital for production of the Mexican staple, tortillas) and other food commodities head south, while assembled goods made from U.S. components head back north. In that mix are some products that could be essential if the flu spreads. Dr. Carlos del Rio, chairman of the global health department at Emory University, wrote in a CNN op-ed, "In the event of a serious flu outbreak in this country, there would be a need for mechanical-ventilator deployments to hospitals. The national stockpile has sufficient ventilators, but the necessary circuits that are needed to operate them are not produced in the United States but in Mexico, so having them come across to this country is critical for taking care of critically ill patients in the United States." "Half of the land-borne U.S.-Mexico trade comes through Laredo," says Keith R. Phillips, a senior economist with the Federal Reserve Bank of Dallas. Much of it heads north along Interstate Highway 35, through Austin, Dallas and on through the heartland. And it's not only the land ports along the border that are conduits for trade and travelers, Phillips points out. The Port of Houston has been one of the fastest-growing ports in the country, with a significant amount of trade from Mexico, and trade also flows into inland ports like Fort Worth's Alliance Texas Logistics Park. As residents of Midland, Texas, can attest, the constant rumble of freight trains coming up from Mexico's deep water ports on the Pacific Coast is further evidence of the deep economic relationship. The first known flu fatality on the U.S. side of the border is emblematic of the problem posed by the symbiotic relationship. The 22-month-old boy who died of the flu in a Houston hospital had flown from Mexico City to Matamoros to visit relatives across the bridge in Brownsville. Many families, Phillips points out, have one foot in both countries. Managers for Mexican industrial plants on the border often live north of the river, while workers in the plants have family ties deeper inside Mexico and frequently head south. The border is a crossing point, not a canyon, and just a brief look at the numbers offer an idea of how busy that crossing point is. In January and February of this year, some $16 billion in exports went south from the U.S., while some $21 billion of imports came north, according to the Texas Center for Border Economy and Enterprise Development at Texas A&M International University. In Brownsville alone, in the first two months of this year, there were 297,478 legal pedestrian crossings north and 284,662 legal southbound crossings. Personal-vehicle crossings were almost double that number. Almost 4 million passenger vehicles crossed each way between Texas cities and their sister communities in Mexico in the first two months of this year, while almost half a million trucks headed south in the same period and 370,000 headed north, according to the center. Texas Governor Rick Perry says any talk of closing the border is "premature." Meanwhile, Perry has declared a state of emergency and called on the Federal Government for support  an irony, his opponents say, given his recent comments about secession. But Perry, cognizant of the economic importance of the border and the close relationship with Mexico, appealed again to Texas pride: "As Texans always do when facing a challenge: We prepare for the worst, we pray for the best. Working together, we will get through this challenge as well." But if the demands to close the border succeed, Texas would have not only a public health challenge on its hands; it would face a disruption in trade that would send an economic tsunami into the heart of America.